Carlo Ancelotti has been sacked as manager of Bayern Munich. Following Wednesday's 3-0 Champions League defeat by Paris St-Germain, the club's board has decided to dismiss the Italian, who replaced Pep Guardiola at the start of last season. 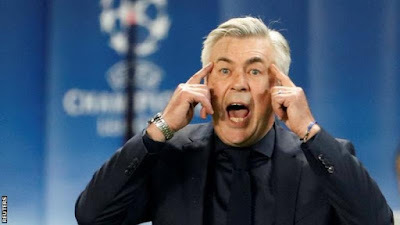 Ancelotti, 58, helped Bayern win the Bundesliga last term, but they only reached the last eight of the Champions League and the German Cup semi-finals. Assistant boss Willy Sagnol will take temporary charge. » Arsenal will attack Bayern Munich, warns Gabriel.